Ten years after September 11, 2001, the American Muslim community continues to be surrounded by a fear created and promoted mostly by a small group of anti-Muslim organizations and individuals. Collectively, these groups have spread their message in twenty-three states through books, reports, websites, and blogs. Other anti-Islam grassroots organizations have utilized this propaganda to “educate” their constituency. The Center for American Progress defines Islamophobia as an “exaggerated fear, hatred, and hostility toward Islam and Muslims that is perpetuated by negative stereotypes resulting in bias, discrimination, and the marginalization and exclusion of Muslims from America’s social, political, and civic life.” This Islamophobia movement’s ability to influence politicians’ talking has made mainstream that which was once considered marginal, extremist rhetoric. This report describes the broader climate of anti-Muslim sentiment, as promoted by anti-Islam grassroots organizations, and examines the various manifestations of this hate in light of the First Amendment. 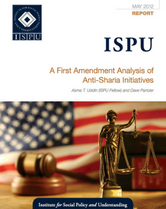 More specifically, this report analyzes the anti-Sharia bills and ballot measures proposed by numerous states and determines the extent to which they comply with free exercise and establishment principles and jurisprudence.